Who Do I Have But You Oh Lord? In my work I am often in the company of people from diverse backgrounds and cultures.At any given time I can hear conversations in English,Japanese,Indian,and a few others that I am unfamiliar with.Being raised in a very small Midwestern town it was quite a cultural shock to be suddenly thrust into an environment that was so different than what I had ever been exposed to. That initial exposure was 25 years ago and in that time I have learned a lot about various cultures and traditions.One of the most important things I have learned is that none of us is really all that different from anyone else.We all have the same basic needs for food and shelter.We all want to provide for those who depend upon us.And we all have a need to be loved. I am often in situations where people speak to me about the problems they are facing in life;divorce,abuse,betrayal,loneliness,abandonment,etc…and what always comes through the hurt and anguish is this need to be loved,to be accepted.And that’s where God comes in my friends. 25 Whom have I in heaven but You? And there is none upon earth that I desire besides You. 26 My flesh and my heart fail; But God is the strength of my heart and my portion forever. 27 For indeed, those who are far from You shall perish; You have destroyed all those who desert You for harlotry. 28 But it is good for me to draw near to God; I have put my trust in the Lord God, That I may declare all Your works. Maybe you have wondered why life has thrown you more than its share of curve balls. Perhaps you too have questioned the logic of why some who aren’t even trying to live for the Lord seem to have it so easy, and yet others who have been faithful for so many years seem to catch all the bad breaks.You’ve probably asked the Lord “when is it my turn”? May I let you in on a great theological secret? We’re all just like you.We’ve all been there.We’ve all had to patiently endure one endless season of heartache after another.And still we soldier on.From one corner of this planet to the other God’s people soldier on for we know that ahead remains the ultimate prize. I have learned through much hardship and disappointment that there is but One who is faithful.”Whom have I in heaven but you”? I have it all in Christ. Many people in churches all over the world have heard that little song sung either in a Sunday School class or perhaps during Vacation Bible School.And while it teaches kids the importance of knowing what you’re listening to is appropriate, it also serves as a reminder that there are many voices vying for their attention. A great many things come wrapped today in nice neat “Christian” packages but once the wrapping has been removed it is exposed for what it truly is.Many churches unfortunately come wrapped this way,which is an indictment of the apostate condition of the church today.Beautiful accommodations,programs for every member of the family,teaching watered down versions of the Gospel message lest someone be offended.Beloved, there is only one way to distinguish between what is real and what is a mere “form of Godliness”, and that is to know Jesus Christ in a real and personal way. Sounds simple enough doesn’t it? We go to church regularly,support the ministry with our finances,read our bibles and pray daily.Isn’t that enough? Friends….that is not what I’m talking about here.Our good deeds will never be “good enough”. Our works and accomplishments will fade into obscurity with the passage of time.They will fail us,if indeed our trust is in them to save us in the end. In Matthew chapter six Jesus was teaching one day about prayer, laying up treasures, and a host of other important topics.So amazed were the people that they were astonished,for Jesus spoke as one who had authority, not as the scribes,or teachers they were accustomed to hearing. 16 You will know them by their fruits. Do men gather grapes from thorn bushes or figs from thistles? In whom is your hope today? Spouse,Family,Pastor,Priest? Do you trust church more than Christ? If so you are setting yourself up for disappointment.Are you counting on your deeds being good enough to get you in? 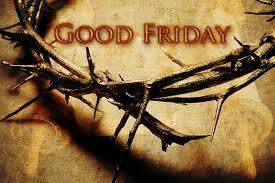 Think about it…if our works and deeds could have been good enough, Jesus died in vain. I encourage you today to humbly submit your whole heart to the Lord Jesus. This past weekend’s Good Friday and Easter services have caused me to do a lot of thinking about my own relationship with God and the church. The funny thing is that the older I get the more I value relationship over religious membership.Maybe part of the reason for that is I have so few true relationships in my life. Relationship with God is possible of course because of the redemptive work of His Son Jesus Christ,while religious membership can generally be had by attending a few classes and agreeing to abide by certain tenants of one’s faith.I guess you could say one is freely given from above while the other is earned here below. To my way of thinking there is unmeasurable value in this relationship with God because it is personal. God has invested Himself in us and that makes it very personal,while religious membership……not so much. The TV commercials declare that “membership has it’s privileges”,but I’m not so sure any more.I’m more inclined to believe that those with a relationship with the Father enjoy the benefits,or privileges.At least the ones that matter. Easter is right around the corner and our family will be attending services with my wife’s mother this year. Instead of going out to a restaurant after service we’ve decided to bake a big pan of lasagna and take it to her house and eat there.After all, given the choice of standing in line for an hour to get a table or going straight to the house to enjoy my wife’s incredible lasagna- it’s a no brainier! Easter will be very different this year as it’s the first since my wonderful father-in-law passed last June 24th.I wish I could express in words what my heart feels about losing him but I lack the vocabulary to do so.No only was he an amazing father,husband,and friend,but he was also a spiritual mentor to me.Lest you think a man in his late 50’s is too old to be mentored consider that we never get too old to learn,especially about things pertaining to the kingdom of God. I’ve never met anyone less pretentious or unassuming than my father-in-law. Raised in the hills of Kentucky he learned at a very early age what hard work was like, and this was a trait that would stay with him all of his life. It was amazing to see what he accomplished with his work ethic and strong faith in God. All who knew him considered him blessed of the Lord, and indeed he was. One of our favorite pastimes was to sit on the back porch and discuss current events, which ultimately would lead into a discussion of the scriptures.I longed for those visits when I could spend an hour alone with him because it seemed as if time stood still when we were together.I learned so much from listening to him.How to deal with people,how to stand for the truth even when it wasn’t popular,how to listen to the Lord’s voice and the importance of obeying His voice. My father-in-law was a man of the Word.He studied constantly and was always seeking to better understand the Bible. Even though he had retired from the pastorate he continued to be faithful in his work for the Lord. What a witness he was! Can you tell I loved him? He was the real deal and I will cherish his memory the rest of my days. My beautiful wife was Daddy’s girl, and she still grieves the loss of her Daddy every day.Though she understands that his work on earth is finished the parting has been very hard.She shares his love of ministry to others and is an accomplished singer, and we enjoy the opportunities we have to minister in other churches in the area.Our hope is that we will be able to continue to do this even more. Easter is about new life,about the Resurrection. One day all of God’s children will be reunited in a place where we will never again know the pain of separation or the sting of death. Because of Jesus and His perfect work of redemption we have a hope that fades not away. 9 receiving the end of your faith—the salvation of your souls. Like most mornings, I looked out the window this morning at the pond behind my house to see if the geese that are nesting there were still there, and happily they were.We’ve had a lot of rain lately which has raised the level of the pond quite high,and in fact I’m kind of worried about those eggs right now.As I was thinking of this it suddenly dawned on me that something was different.Wait a minute…what’s that green stuff in the yard? Seriously! It finally happened,the long winter has ended and Spring is here! It may sound corny,and that’s OK if it does but Thank You LORD! We have endured much this past winter and our family is so thankful that it’s over. We spent a lot of time in the yard today just enjoying the warmth of the sun and it seemed to raise everyone’s spirit. I even planted some pansies for my wife and it was awesome to see the smile of approval on her face! Funny what Spring does to us isn’t it? Everything is new and fresh,sort of like our relationship with the Father when we ask Him to come into our hearts and make us clean. The Bible is very clear about ministry.It’s an act of love between two people,it’s about meeting the basic needs of life.It’s about healing and restoring the whole man,body and soul.Real ministry happens as a result of a relationship with Jesus Christ. From where I set on the front row I see ministry at it’s best.I see people loving people,needs being met.Hearts are mended,lives restored,families who actually love one another. I also see the hurting turned away.I see the lonely,desperate to feel loved yet walking out of the house of God as empty as when they came in.I see the sick who have no hope looking for someone,anyone to extend a hand of compassion yet no hands are extended. Real ministry isn’t hard.In fact,when our hearts are filled with His love the easiest thing to do is extend that love to another. 32 All the nations will be gathered before Him, and He will separate them one from another, as a shepherd divides his sheep from the goats. 37 “Then the righteous will answer Him, saying, ‘Lord, when did we see You hungry and feed You, or thirsty and give You drink? 38 When did we see You a stranger and take You in, or naked and clothe You? Lord help us to desire to extend your hands of mercy and compassion to those who have none.